We’re not sleeping enough. We’re watching too much Netflix, checking social media, worrying, checking social media again and worrying some more. Our poor brains are so overloaded with information, the wrong light and life in general that it’s not surprising that we’re finding it hard to switch off. The people who find sleeping easy are often to be found spreading the word via the very social media channels that keep us awake. Some meditate, others use heavy duty ear plugs. There are the hot bathers, the healthy eaters, the aromatherapy aficionados, the hypnotism lovers and the sheep counters. None of the above work for me. I have two small children, a husband with a propensity for snoring and a 2:30am wake up call. Sleep is the thing that I would love to achieve but it doesn’t come easily. I’m not going to sit here and write about a miracle cure but something that has been helping me to switch off and stop my busy mind wandering is the use of a pillow spray. Smell is the strongest and most suggestible sense we possess and every time I spritz a lavender and chamomile concoction on my pillow I’m transported to a spa, my breathing slows and my mind starts to clear. It’s such a simple thing but it works. 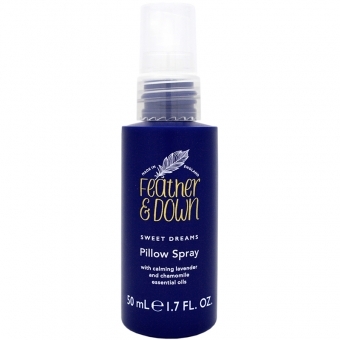 My two favourite night time sprays are This Works Sleep Plus and Feather and Down Sweet Dreams Pillow Spray. The former is a better product but I love the smell of the Feather and Down one. It’s comforting, cocooning and just a little bit addictive.